Although Fuller’s best known beer is probably London Pride, their ESB is arguably the best beer in their standard lineup. That’s not just me saying that, as ESB has twice been crowned World Champion Beer. This collaboration with Moor Beer isn’t just about rebrewing that stalwart, though. They’ve taken the original 1971 recipe, and enhanced it with a swathe of international hops. Although I’m moderately ancient, I certainly wasn’t drinking ESB in 1971 so I don’t know how substantialy it’s changed since then. It’s a fair guess that it wouldn’t be fair to directly compare the modern ESB to this Rebirth, so I’m trying to judge it on it’s own merit – but it is hard to avoid the comparison. 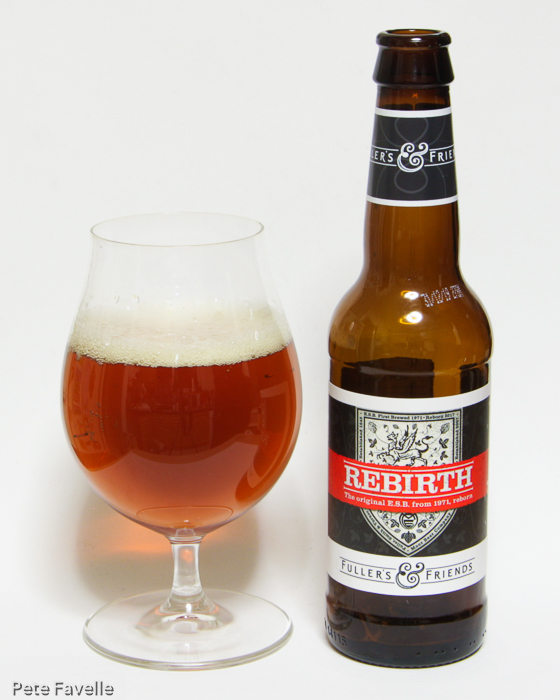 Rebirth is brewed at 6.0% ABV, which puts it a little stronger than the beer that inspired it. It’s a beautiful, dark amber beer with a fairly fleeting, open textured head on it. Visually, at least, it bears a stong resemblance to its inspiration. The aroma is surprisingly light; a little toffee and some fairly gentle, earthy hops. The first thing that strikes you in the mouth is a fairly aggressive carbonation. The flavours are malty, but it’s light bodied and although there’s a decent bitterness from the hops it’s indistinct and it lingers, growing harsher over time. The finish is all about that slightly harsh, woolly bitterness that distracts from everything else. Fundamentally, this comes across as a bog-standard Best Bitter – certainly not Extra Special, and certainly not strongly reminiscent of the modern Fuller’s version. It’s ok, but nothing special. 2.5 stars. Each to their own. It was my favourite out of the set.